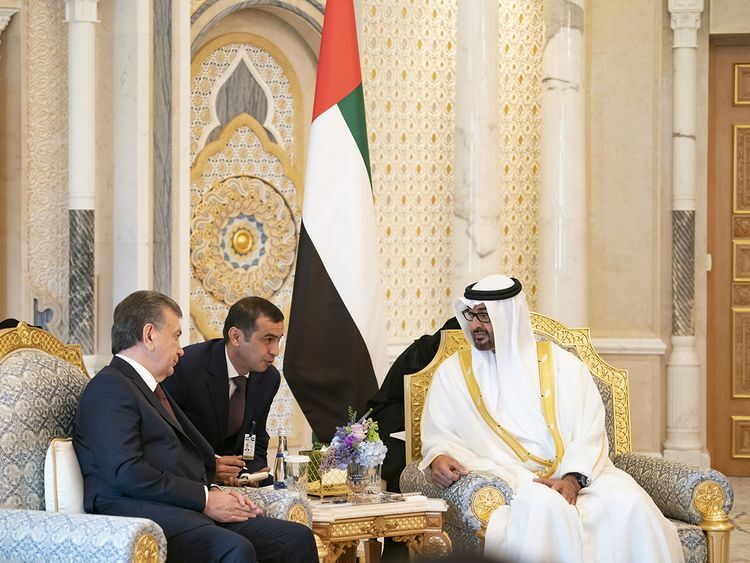 ABU DHABI: His Highness Shaikh Mohammad Bin Zayed Al Nahyan, Crown Prince of Abu Dhabi and Deputy Supreme Commander of the UAE Armed Forces, met with the Uzbekistan President Shavkat Mirziyoyev on Monday to discuss ways of enhancing bilateral relations and tackling a variety of regional and global issues, according to a statement from WAM. During an official session of talks at the Presidential Palace, Shaikh Mohammad and the Uzbek President discussed ways to expanding joint cooperation across investment, economic, agricultural, tourist and industrial spheres. Shaikh Mohammad stressed the need for harnessing investment, economic and cultural opportunities available in the two countries and building constructive partnerships between the public and private sectors. President Mirziyoyev underscored his country’s desire to expand and diversify its relations with the UAE to include investment, economic, cultural and industrial sectors driven by the shared political will and promising potential available in both countries. Shaikh Mohammad also hosted a luncheon banquet in honour of President Mirziyoyev and his accompanying delegation.